Building a garage to hold everything from cars and bikes to tools and sports equipment means knowing the exact sizes available for standard models. Garage door sizes are standard as well, with a slight range to accommodate the needs of every family garage. One car, one door, just the right size. A single garage is large enough to hold one family car with a bit of space for storage around the perimeter. The single garage isn't meant for larger trucks or vans but can fit a sport-utility vehicle (SUV). 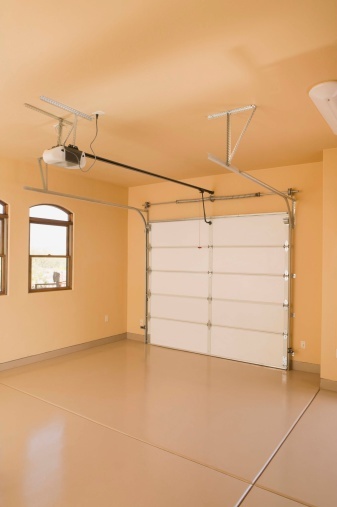 The single standard garage door is 7 feet (or 84 inches) high. The width varies depending on the builder and the needs of the user, ranging from 8 to 10 feet wide. Those with an SUV will find that the 10-by-7-foot garage door is the right fit. Four-door family cars will easily fit through an 8- or 9-by-7-foot door. For homes that have multiple cars or larger SUVs or trucks, a double garage is ideal. Those who prefer storage space in the garage may opt for a double as well since one car can fit in the space with extra room for storing lawn equipment and tools. Like the single garage door, double garage doors are 7 feet (84 inches) in height. The width of double doors ranges from 12 to 16 feet. A 14-by-7-foot double garage door is wide enough to fit two family cars in side by side, but it may be a tight squeeze trying to comfortably fit an SUV and a four-door car side by side. Recreational vehicles loom taller than the average SUV and, as such, need extra height built into the garage and the garage door. The standard size for an RV garage door is 8 to 9 feet tall (as opposed to 7), with a width of at least 16 feet. Since homes don't usually come with RV-sized garages, the ability to customize your garage for your specific RV needs means the chance to add extra width for storage or additional cars. A three-car garage can be customized to include an RV height, giving ample room for all your vehicles. Customized garage doors can be made to match commercial standard garage doors if your neighborhood and local building regulations allow for a large structure on your property. Commercial-sized garage doors are usually 24 feet high with an inch or two added as needed. The width is around 32 feet, which is double the size of the standard double or RV garage door. Most homeowners will never have a need for a commercial-sized garage, but for those looking for a customized design, the options are available to go wide and tall. Can You Enlarge a Garage Door?